Another busy field season at Newberry wrapped up at the end of November. The pumps, piping and other equipment has been put in storage and the well is shut in for the winter. Over the next few months we’ll be analyzing the data collected during stimulation and working with the Department of Energy to move forward with the project. 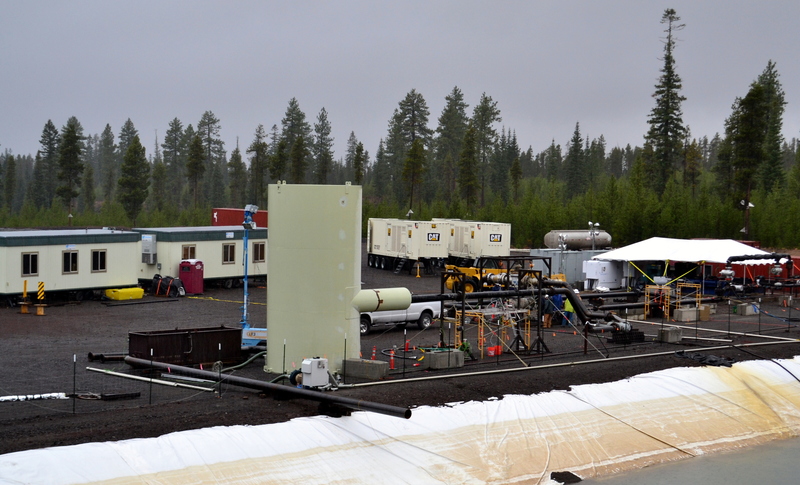 The next stage in the Newberry EGS Demonstration project includes planning, permitting and drilling a production well. The stimulation injected almost four million gallons of water over 32 days of pressurized pumping. During this time 397 microseismic events were detected by the seismometer array, indicating the depth and volume of the EGS reservoir produced. Biodegradable diverters were injected on two separate occasions during stimulation and resulted in the creation of multiple zones of increased permeability within the reservoir. More information about the diverters, to TIZMs, can be found in our previous blog post (link). Preliminary results from the stimulation were presented at the American Geophysical Union Annual Meeting in December, and the poster summary from the meeting can be found here: AGU Newberry 2014 Poster. The analysis of the pressure, flow, seismicity and water data will continue over the next few months. The reports generated from the dataset will inform planning, permitting and execution of the next stage of work at Newberry. While data analysis is ongoing, scientific papers are currently being prepared for publication and will be presented at scientific meetings in the near future. We’re quite happy with the stimulation results and look forward to future work at the Newberry EGS Demonstration site. The blog will be relatively quiet over the winter months, but you can expect more frequent updates in the spring as we gear up for more work at Newberry. In the meantime, here are a few more photos from the field season. 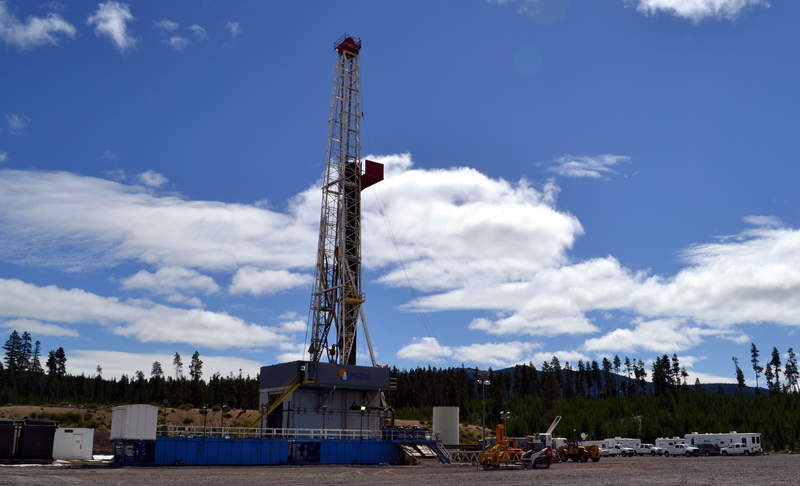 The drill rig up and running on the injection well pad at the Newberry EGS Demonstration. 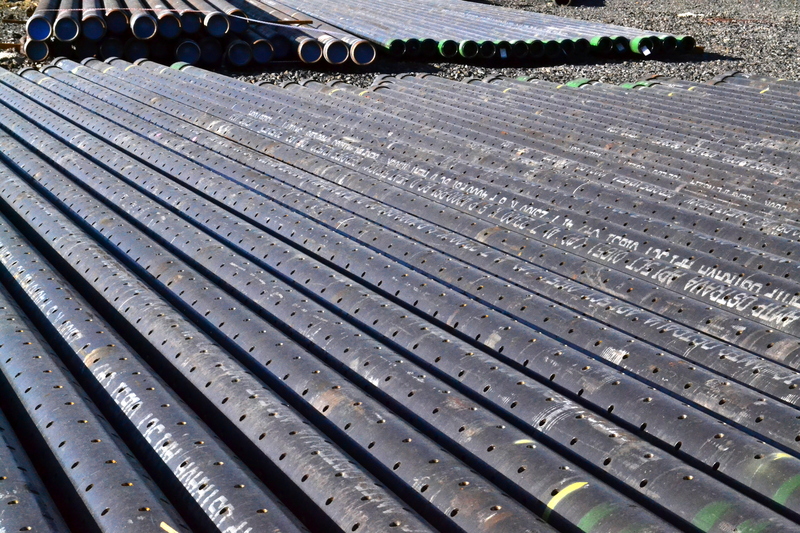 Slotted casing piled on site before it was installed in the bottom of the injection well at the Newberry EGS Demonstration project. Slotted casing allows water to move in and out of the well and keeps the rock walls from collapsing inward. 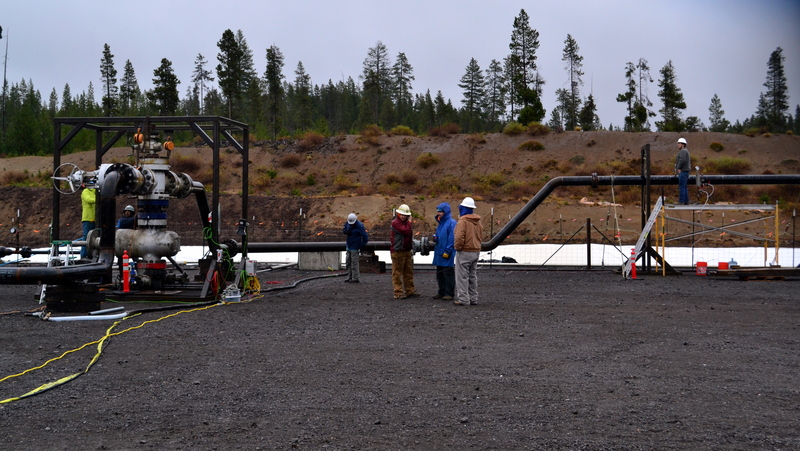 Setting up for the flow test on a drizzly day in late November, 2014. Opening the wellhead master valve at the start of the November, 2014 flow test.